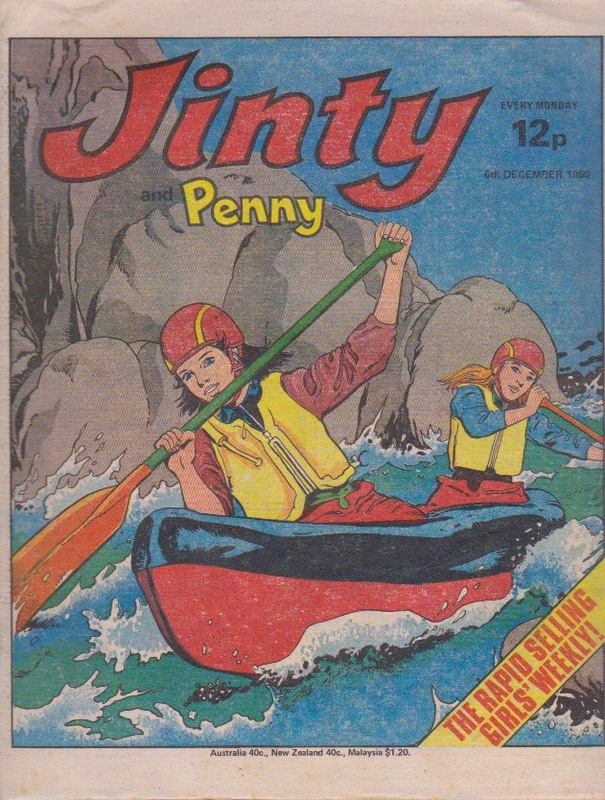 One of the most colourful and striking Jinty covers in my opinion, and it’s another of my favourites. 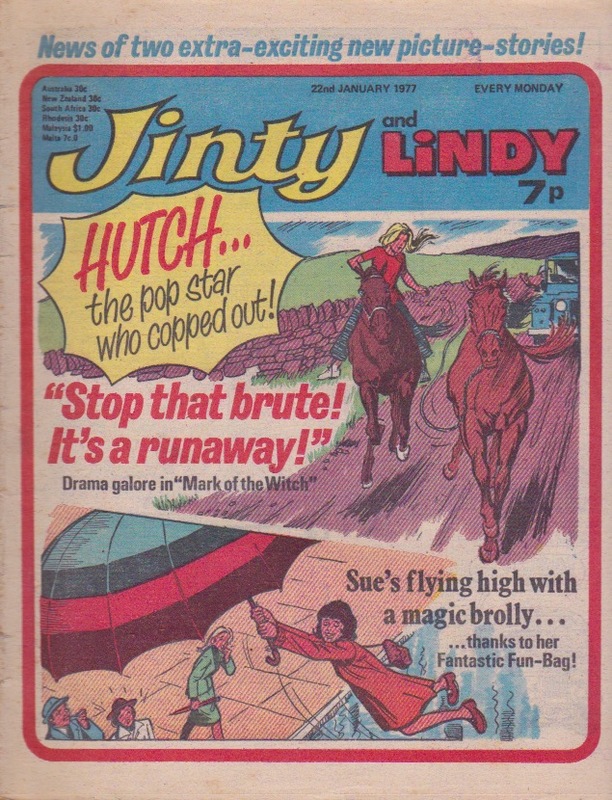 On the cover, Henrietta is making it plain to Sue that she does not like Sue putting an umbrella into her while Emma stops a runaway horse but gets no thanks. As far as the villagers are concerned, she is a “bad ‘un” and that’s that. Only Alice is friendly and in this issue she offers her hand of friendship again. Will Emma take it next week? Two stories end in this issue. Hetty reaches breaking point and snaps from all the hatred she is receiving. But Jo sees the consequences of the hatred against Hetty that she fermented and learns the value of forgiveness – not to mention getting her facts straight. Druid Caractacus finally catches up with Gertie, but she is pleased to see him because she is in a spot of bother. Next week we will see the start of one of Jinty’s most enduring and popular features – “Gypsy Rose’s Tales of Mystery and Magic“. 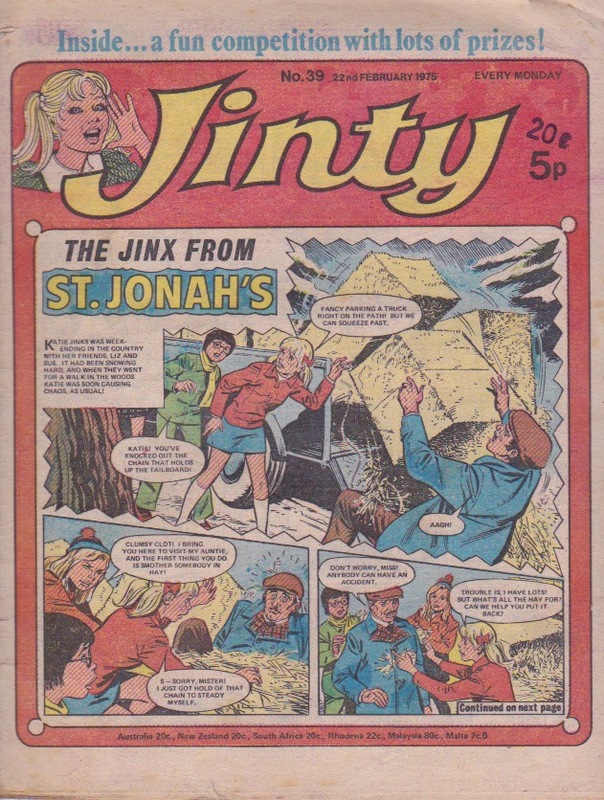 Also starting next issue is “Freda, False Friend”, Phil Gascoine’s first Jinty story for 1977. The origin of the Sceptre of the Toltecs is revealed, so the story is heading for its climax now. Made-Up Mandy has played “ghost” to help a friend, but narrowly missed being caught. And now she’s set on going on safari, although her nasty employer Miss Agate won’t allow it. So we have a pretty good suspicion that Mandy will be headed back to the make-up kit for another disguise next week. Whatever has possessed Martine is still causing trouble and it’s all Tessa can do to concentrate on ballet so she can get into the City Ballet Company. This is another newly-arrived Jinty for my collection. The Jinx from St Jonah’s uncovers a man running a pony-selling racket and turns to an ancient gun to stop him. But knowing our Katie, the crook has more to fear from her jinxing than an ancient gun! The latest arrival in “Dora Dogsbody” is eating everyone out of house and home, and for once Dora sides with Ma Siddons. In “Tricia’s Tragedy“, Tricia would have done well to heed the old adage, “beware the Greeks, even when they offer gifts” when her estranged relatives suddenly offer her a surprise invitation to train in their pool, especially when her father has a premonition that something horrible will happen if she accepts the invitation. But she does not heed the warning any more than the Trojans did. 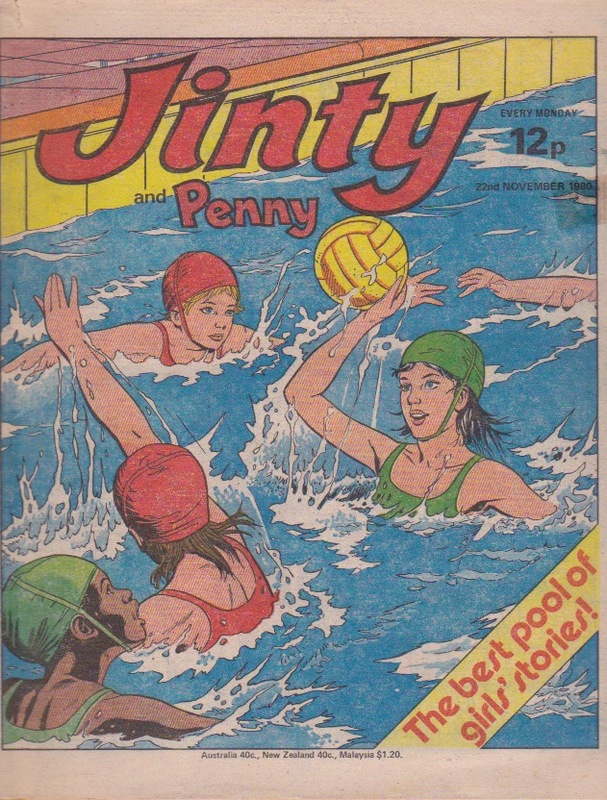 So we can pretty much guess where that is going to lead, and it starts with the final panel where cousin Diana is diving dangerously on top of Tricia. “Merry at Misery House” is getting the blame when someone plays tricks on Miss Ball the sadistic guard. Even her fellow inmates find it hard to believe she is innocent. But then a weird masked figure appears in the final panel, and it can’t be Merry. In the “Kat and Mouse Game”, Kat hurts her leg. It’s her own fault, but Mouse thinks it’s hers, and of course Kat is taking full advantage of this. Miss Lush is full steam ahead on making her “Prisoners of Paradise Island” unfit to win the hockey championship. Sally, the only person to realise, is at a dead end, and we are told that next week she is going to be “lost at sea”. “Bird-Girl Brenda” gets more than she bargained for when she uses her flying power to map a canal – she finds an unexploded WWII bomb and must find a way to alert the authorities without giving herself away! “Always Together” is on its penultimate episode. Beth has fallen dangerously ill. Jill has little choice but to take her to hospital and risk giving themselves up to social welfare. And in “Slave of the Mirror”, we get a hint that the mirror may not be all that bad when it leads Mia to what looks like an accident involving Major Rose. Or does it have some hidden agenda? We shall have to wait and see. This is the advertisement for the very first Jinty. It is in June & Pixie 11 May 1974, which I have just acquired. It covers a two-page spread in the centre of the June. After so many years, I finally came into a complete copy of this issue. My old copy had pages missing. Now I have a complete copy, I can read The Kat and Mouse Game episode in its entirety. Kat’s trick succeeds in getting Mouse expelled, but then Kat realises she still needs to take advantage of Mouse to continue the role of the Tiger in the ballet as Mouse can perform it better than she can. But we are told that Kat is going to play one trick too many next week. Ah, the thing that has been the downfall of many a troublemaker in so many stories. And now that I can read the Dora Dogsbody episode, I see an ex-sergeant major is trying to run the dogs hotel in military fashion and even the unpleasant Siddonses are unhappy about it. However, the arrogant sergeant-major does not meet his Waterloo until next week. As the cover shows, Kate the Jinx tries her hand at ballet, but it meets with her usual disaster. The same goes when she tries supposedly harmless things for a hobby like turning pages for the school orchestra or stamp collecting. Merry escapes from Misery House (and it’s about time!). But last week we were warned that fate was going to play a cruel trick on her. And it is now revealed to be amnesia. How can Merry stay on the run and keep one step ahead of Misery House if she’s lost her memory? Two new stories start: “Bet Gets the Bird!” and “Cinderella Smith”. Bet saves Rosy Posy the parrot from a cruel man and brings her to her boarding school. But we can see Rosy Posy is going to bring hijinks to Bet’s school, and she starts by being mistakenly enrolled as one of the pupils! And as the title of the latter suggests, we have a new Cinderella-type story. Cindy Smith goes to stay with her cousins while Dad goes away. Cindy thinks it’s going to be great because the cousins are so wealthy and they have animals. But she did not count on her cousins being so horrible, and already they’re laying into her with a cane and giving her a ghastly room. And next week Cindy starts school in second-hand clothes when her cousins can more than afford to buy her a whole new uniform. The “Slave of the Mirror” tries to get rid of the mirror. But she should have guessed she wouldn’t be able to get rid of the haunted mirror that easily. “Daddy’s Darling” isn’t proving popular in school because her father’s over-protective treatment of her has her classmates thinking she is a snob. And now another evacuee is arriving in the household, but what is Dad going to say? He was not happy with one evacuee to begin with. In “Tricia’s Tragedy”, Tricia begins to learn the reason for the feud between her family and Diana’s. But Dad is being thrown out before he can properly explain – now what have Diana’s parents got to hide? And it casts even more suspicion on the events that are binding Tricia to Diana. It’s the final episode of “Child of the Rain”. It is finally revealed that what gave Gemma such incredible strength when it rains is now threatening her very life because it infected her leg. When conventional medicine fails, all hopes are pinned on Dad’s medicine man friend in the Amazon. The tension intensifies in “Girl the World Forgot” when it looks like the unfriendly presence on the island has now become so unfriendly that attempts are now being made on Shona’s life. And to make it worse, Shona blows her chance of rescue and escape by lighting her beacon for Guy Fawkes – only to have a ship pass by next day and no beacon with which to signal for its help! But the growing menace gives you the impression that the story is now building towards its climax. Phil Gascoine rarely illustrated a Gypsy Rose story, but he does so here with “Wheels of Fortune”, about a car and a mascot who bring good fortune to their family. But, as Dad discovers (though he does not admit it), bad fortune comes if the family abandons them. Gascoine was between serials at this point, so perhaps that was why he was commissioned to draw this story. In “Pam of Pond Hill”, Mr Glover the French teacher finds himself being arrested by the gendarmes because they think he kidnapped the mystery boy who has been hanging around the French school trip! The blurb for next week says the gang are going to have a day to remember. Let’s hope that’s not because they are all going to end up in the Bastille or something. Nadine now counts herself in on the netball team and she’s Goal Attack! But she’s still thinking more of disco. And the Daily Dozen provides Sue with a witch’s outfit to go with her cauldron and potion making. When the villagers see, they applaud the old witch Gran Hayden and her Daily Dozen. Now that makes a delightful change from superstitious villagers hating and persecuting girls they believe to be witches, as they do in “Wenna the Witch” and “Mark of the Witch!“. The three stories that started in the New Year issue are now on their second episodes. Marie Smart has agreed to her godmother’s blackmail not to win any medals so that her sick brother can live at the godmother’s hall and away from the air pollution that could kill him. But she is finding that deliberately losing after winning all her life is harder than she thought when she does no swotting in order to fail her exams, but comes out on top in spite of it! In “Land of No Tears“, Cassie has just arrived in it and what she sees already has her gearing up to be a rebel – but also facing the price she has to pay for it when Hive Mother directs Perfecta to punish her. And now that Cassie has seen that they are capable of locking four-year-olds in cupboards to teach them self-control (and Perfecta lauds it as to why she is so perfect), she is really alarmed as to what her punishment could be. Ferne is adamantly sticking to her resolve to continue her pretence at being paralysed to punish her father, but the temptation to dance is all around her when she is sent to the ballet school. Keeping up the pretence is clearly going to be harder than she thought. Nadine is upstaged by gimmicky disco dancers who depend more on costumes and appearance than skill to clear the floor. But in the end the gimmicky dancers are upstaged and the floor goes back to Nadine, with the help of netball! Pam’s first full story for 1981 begins. It looks like the new year is not going well for her when her cousin Veronica comes to stay. Pam realises Veronica is a fraud who gets attention and admiration with boasting and pretence, but Veronica is very clever at turning Pam’s friends against her. So how is Pam going to catch Veronica out?